To find a person, place, or thing with Maps, tap the search field at the bottom of the iPhone screen to display the keyboard. Now type what you’re looking for. You can search for addresses, zip codes, intersections, towns, landmarks, and businesses by category and by name, or combinations, such as New York, NY 10022; pizza 60611; or Auditorium Shores Austin TX. When you finish typing, tap Search. After a few seconds, a map appears. If you searched for a single location, it’s marked with a single bubble. 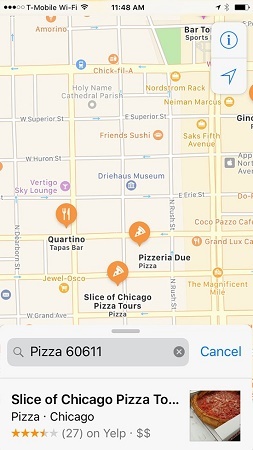 If you searched for a category (Pizza 60611, for example), you see multiple bubbles, one for each matching location (pizza joints in or close to the 60611 zip code). Search for Pizza 60611 and you see bubbles for all pizza joints near 60611 (downtown Chicago). With iOS 10, if a bubble has a number rather than a name, you’ll see that number of places when you zoom in. Whenever you start a search in Maps, eight icons pop up just below the search field: Restaurants, Fast Food, Coffee Shops, Groceries, Shopping Centers, Bars, Hotels, and Gas Stations. Tap an icon to see nearby establishments of that type.